Artist Stella DeVenuta, OSF, will lead participants in making a mandala. Pictured is River Soul, a piece she created. 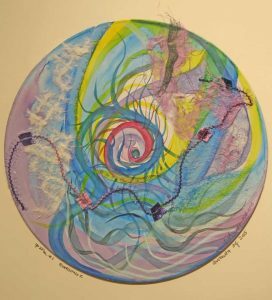 SINSINAWA, Wis.—Artist Sister Stella DeVenuta, OSF, will lead a retreat, River of My Soul: The Ebb and Flow of the Journey, at Sinsinawa Mound June 3-4, 2016. This retreat will allow participants to discover the natural rhythm and flow of their creative side–even those who don’t consider themselves artistic. DeVenuta is a Franciscan sister living, creating, and ministering in Milwaukee, Wis. Drawing inspiration from John O’Donohue’s quote, “I would love to live like a river flows, carried by the surprise of its own unfolding (Connemara Blues),” each person will be invited to engage in a reflective process using the mandala as a means of expression. The mandala is an art piece that incorporates repurposed records and optical lenses assembled with threads, painted pieces and rice papers. DeVenuta utilizes various types of mantras, such as music, to help participants anchor their thoughts and dive deeper into a sacred space of reflection and creativity. There will be time for personal silence, group sharing, ritual and creativity. The registration deadline is May 27, and the fee is $117 for an overnight guest or $79 for a commuter. For more information, contact Guest Services at 608-748-4411 or visit our website at www.sinsinawa.org. Sinsinawa Mound, the Motherhouse for the Sinsinawa Dominican Sisters, is located in southwest Wisconsin on County Road Z, off Highway 11, about five miles northeast of Dubuque.